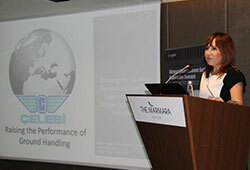 Çelebi participated to The Airport Development and Expansion Summit 2012. The Airport Development and Expansion Summit 2012 was held in Istanbul on December 13-14, 2012. It featured the most prominent industry leaders and government officials from across the globe providing informative and inspiring discussions pertaining to Turkey’s current needs and their ambitious future in the Airport development arena. Turkey welcomed the international community to join this forum to discuss new strategies and technologies that can assist in building the airport infrastructure in order to accommodate the growing demands of the domestic and international aviation market. Mrs. Athina Kapeni, Global Sales & Marketing Director of Çelebi Aviation Holding was one of the keynote speakers in the summit. The topic of her speech was “Striving for Quality Services, the Common Task of Airports, Airlines, and Ground Handlers.” Through her presentation, Mrs. Kapeni highlighted the need of cooperation and collaborative decision making in attaining quality service for the airports’ end users. Çelebi was emphasized as a global ground handler and cargo handler with expanding operations in Europe and India. The presentation furthermore illustrated the critical role that Çelebi plays in ensuring the delivery of quality services in all realms of its ground/cargo handling operation.